Jones, A. A picture of trans Canadians’ health and access to healthcare. UBCMJ. 2016: 7.2 (40-41). Andrea Jones is a PhD student in the School of Population and Public Health at UBC. Her thesis research examines the incidence and impact of anxiety following workplace musculoskeletal injury. Prior to this, she completed BSc and MSc degrees in Kinesiology at McMaster University in Hamilton, Ontario and worked in medical education and workplace health promotion. 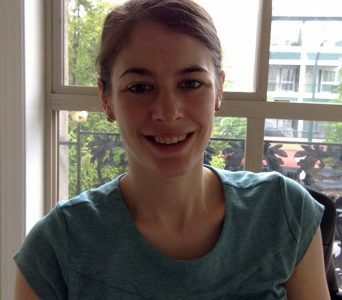 Her other research interests include work disability policy, the psychosocial work environment, and mental health services. Multiple institutional and social factors contribute to poor health outcomes among trans people;9,10 however, access to healthcare is of particular relevance to healthcare systems and providers. In Canada, despite universal health insurance for hospital and physician services, trans people experience a number of barriers to obtaining access to healthcare. Previous and potential future experiences of discrimination prevent trans people from obtaining healthcare when they need it. In Ontario, 21% of trans people report having avoided emergency care due to the perception that their trans status would negatively affect the encounter, and 52% of trans people presenting to the emergency department report negative experiences associated with their visit.11 In addition, over 10% of trans Ontarians report using hormones obtained from non– medical sources such as a friend or relative, and a small minority report attempting or completing self–performed surgeries.12 This suggests that low access to transitional services may facilitate precarious healthcare practices. Lastly, further research in Ontario demonstrates that trans people lack access to proper HIV care, support, and prevention information, as available HIV services are largely designed for and targeted at cisgendered individuals.13 These examples illustrate that there is significant room within the healthcare system to improve trans people’s access to healthcare. Being trans should not be associated with poor health outcomes, such as HIV infections, clinical depression, and attempted suicide, but in Canada and other countries around the world, these associations are observed.1-5 Multiple social and system level factors contribute to the health disparity of trans people, and access to healthcare is among these factors.10 Media publications have described the present time as a critical tipping point for trans equality in the United States16—could a similar statement be made in Canada? In terms of access to healthcare, do initiatives such as Trans Care BC indicate that barriers to access are slowly being lifted? Only time will tell, but in order to assess the efficacy of these initiatives, trans health issues require more attention in research and population health surveillance and monitoring.Trans health disparities are unjust, and the importance of inclusive healthcare systems that are trans friendly and able to meet the unique healthcare needs of trans people must become and remain a priority. The author does not have any conflicts of interest to disclose. Grant JM, Mottet LA,Tanis J, Harrison J, Herman JL, Keisling Injustice at Every Turn: A Report of the National Transgender Discrimination Survey. Washington, DC; 2011. Poteat T, Reisner SL, Radix A. HIV epidemics among transgender women. Curr Opin HIV AIDS. 2014;9(2):168-73. Bauer GR, Scheim AI, Pyne J, Travers R, Ham- mond R. Intervenable factors associated with suicide risk in transgender persons: A respon- dent driven sampling study in Ontario, BMC Public Health. 2015;15(1):525. World Health Policy Brief: Trans- gender People and HIV. Geneva, Switzerland; 2015. Rotondi NK, Bauer GR, Travers R, Travers A, Scanlon K, Kaay M. Depression in male-to- female transgender Ontarians: Results from the trans PULSE project. Can J Community. 2011;30(2):113. 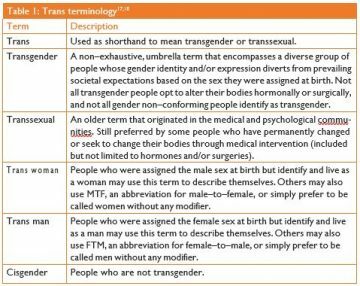 Bauer GR, Scheim AI, for the Trans PULSE Proj- ect Transgender People in Ontario, Can- ada: Statistics from the Trans PULSE Project to Inform Human Rights Policy. London, ON; 2015. Solar O, Irwin A Conceptual Framework for Action on the Social Determinants of Health. Social Determinants of Health Discussion Paper 2 (Policy and Practice). WHO Library. Geneva, Switzerland; 2010. Scout N. Social Determinants of Transgender Health. Recorded presentation at the APHA 134th Annual Meeting and Boston, MA; 2006. Reported emergency department avoidance, use, and experiences of transgender persons in Ontario, Canada: Results from a respon- dent-driven sampling survey. Ann Emerg Med. American College of Emergency Physicians; 2014;63(6):713-20.e1. Rotondi NK, Bauer GR, Scanlon K, Kaay M, Travers R, Travers Nonprescribed hormone use and self-performed surgeries: “Do-It- Yourself ” transitions in transgender commu- nities in Ontario, Canada. Am J Public Health. 2013;103(10):1830-6. Logie CH, James LL, Tharao W, Loutfy “We don’t exist”: A qualitative study of marginaliza- tion experienced by HIV-positive lesbian, bisex- ual, queer and transgender women in Toronto, Canada. J Int AIDS Soc. 2012;15(2):1-11. Vancouver Coastal The Provincial Trans- gender Health Program (THP): Feedback from Transgender Community Members. Vancouver; 2013. Steinmetz K, Gray E. America’s Transition (cover story).Time. Chicago; 2014 Jun;183(22):38-46. Bauer GR, Hammond R, Travers R, Kaay M, Hohenadel KM, Boyce M. “I don’t think this is theoretical; this is our lives”: How erasure im- pacts health care for transgender J Assoc Nurses AIDS Care. Elsevier Ltd; 2009;20(5):348- 61.